The Romulus GM Powertrain                             ”                                announced. Vol. 72, No. 09         proud of the hard work and com-  sions used in several GM cars,  recently for the decision to close  at the Romulus plant. month. core business going forward,” she  Barra visited the plant to meet  line for the change was  lion V6 engines, according to GM. THE NORTHVILLE         gently landing feet. place at the Plymouth complex Jan. 20.
the month of March as a ges-   ents Melissa and Tim Wandrey, all of   to compete at age 4.
ture of appreciation to mem-   Burton. See page 2.    started. She loves it, though,” said Melissa  research done by nutritionists. said. THE PLYMOUTH           es them about nutrition, muscle building. It  Plymouth resident Cindy Kopenski is  Scotland while there. Vol. 19, No. 09           social skills,” Tim Wandrey added. 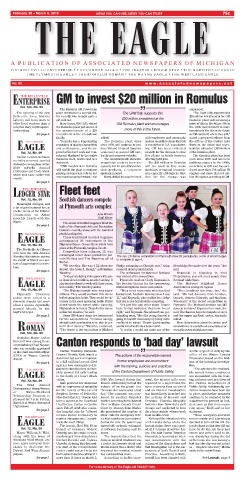 Midwest Highland Dance Association. Association is among six regions. for the competitions. “It takes energy,  going to benefit immensely by being more  added. against two emergency dis-             with the training, policies and practices          tion. day hospital stay for “altered  He questioned the number of  the phone system volume back  statement. Detroit Red Wing Alumni      center could not get help for  reviewed the medical records  pension of both Rowell and   wrote in the court filings.